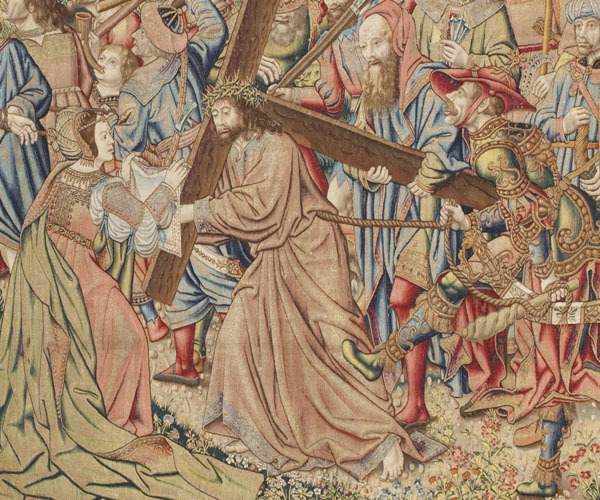 Several Passion tapestries related to the production of Pieter van Aelst and the cartoonist Jan van Roome are recorded in the inventories of Margaret of Austria, grouped as ‘different mysteries of excellent and rich tapestry in gold and silk’. They were received, as heir to his aunt Margaret, by Charles I of Spain and the Fifth Holy Roman Emperor, who gave them as a wedding present to Isabella of Portugal in 1526 through his treasurer, Diego de la Cuadra. 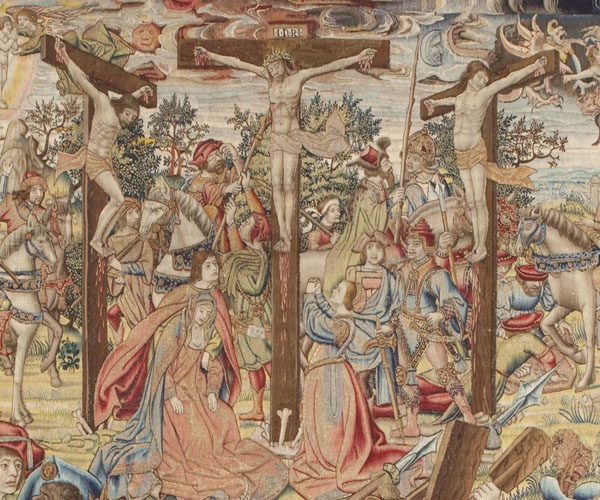 Several passional tapestries related to the production of Pieter van Aelst and the cartoonist Jan van Roome were recorded in the inventories of Margaret of Austria, grouped as “different mysteries of excellent and rich tapestry in gold and silk.” They were received by Charles I of Spain and V Holy Roman Emperor as heir to his aunt Margaret. The emperor sent them to Isabella of Portugal in 1526 through his treasurer, Diego de la Cuadra, as a wedding present. Although the Spanish royal collection only holds two pieces from this series, ‘The Way to Calvary and Encounter with Veronica’ and ‘The Descent’, it was originally comprised of four, just like the series known as the Square Passion of Margaret of Austria, which is kept in the Palace of La Granja de San Ildefonso. The two pieces kept in the Spanish collection were first exhibited in the Royal Pavilion of Spain at the Universal Exhibition of Paris in 1900. The other two panels (which, in terms of the Gospel, precede the two extant ones) are the ‘Washing of the Feet’ and ‘Christ before Pilate’. They were given to diplomat Charles A. Blanc by Queen Isabella II, in recognition of his unconditional support for her when she was accused regarding the squander of the royal exchequer and the fraudulent sale of crown jewels. The two tapestries decorated the Palace of Baron Blanc in the Piazza del Popolo of Roma and were bequeathed to his two daughters. They were finally purchased between 1959 and 1963 by the Rijksmuseum of Amsterdam and the Musées Royaux d’Art et d’Histoire in Brussels, where they are currently preserved. 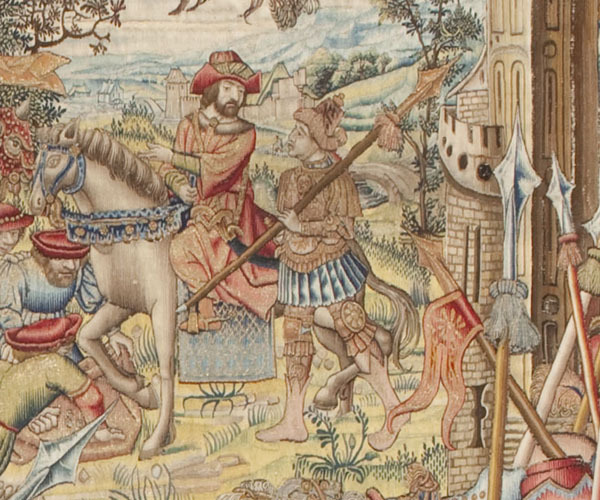 J. K. Steppe, “Inscriptions décoratives contenta des signatures et des mentions du lieu d’origine sur des tapisseries bruxelloises de la fin du XVe et du début du XVIe siècle”, Tapisseries bruxelloises de la pré-Renaissance, Brussels: Musées Royaux d’Art et d’Histoire, 1976, pp. 93-230. C. Herrero Carretero, Tapices de Isabel la Católica. Origen de la Colección Real Española. 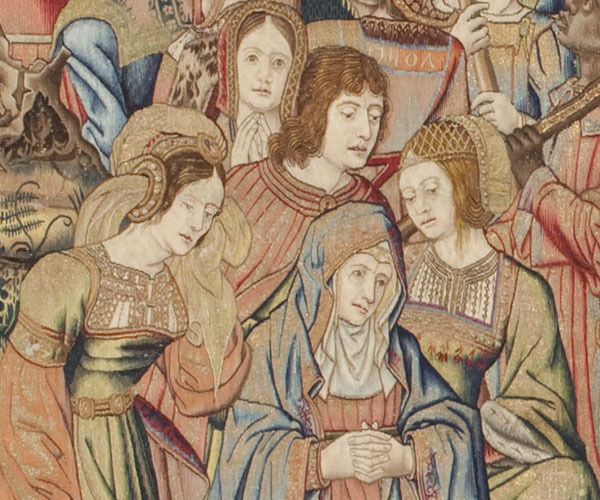 Tapestries of Isabella the Catholic. Origin of the Spanish Royal Collection, Madrid: Patrimonio Nacional, 2004, pp. 65-69 and 115-119.